Budz, although I try, my house isn’t 100% pretty. It’s easy to lie to the world and make it seem that way on the internet though. 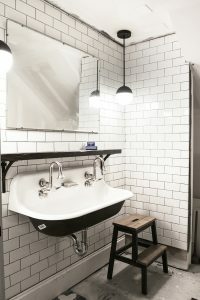 A few of you have noticed that I never post photos of my bathroom, and that’s for good reason – there’s only shame to share. We have two bathrooms in our house, one in the basement, that for the time being consists of a toilet and a roll of toilet paper. The other is on the second floor of our house, and is used by the entire family as well as guests. Herein lies the problem. We are hosting four holiday events throughout the next five weeks, that means lots and lots of people are going to be making visits to our super-sad bathroom. They are going to see the dirty caulk that is never 100% free of boy pee, white grout that should’ve never been used in a main bathroom, dated chrome fixtures, and shiny faux-marble tile. Talk about having to put lipstick on a pig. Thankfully, with a little nudge from the folks at Ace Hardware, I was able to finally tackle this project that had long been at the bottom of the to-do list. 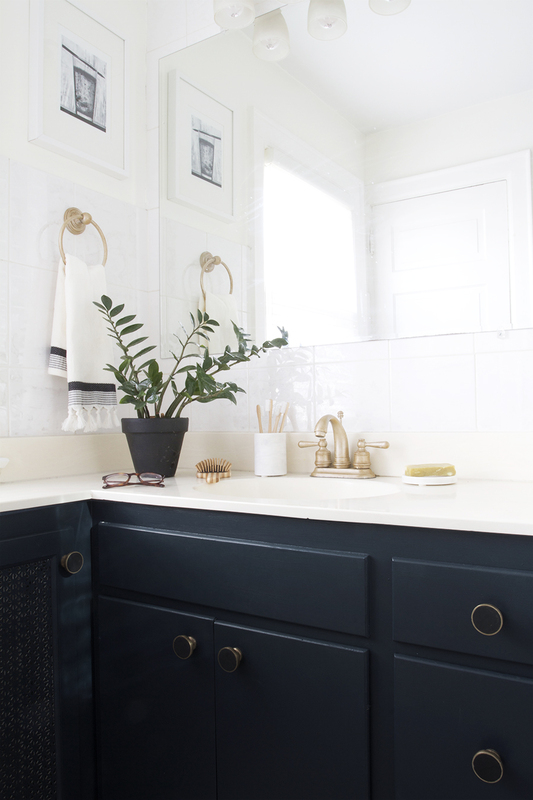 Ace had asked us Ace bloggers to give their color matching technology a try on our next project – I knew as soon as I heard about it, that this was a project solely meant for the upstairs bathroom. For reference here is the before and after. 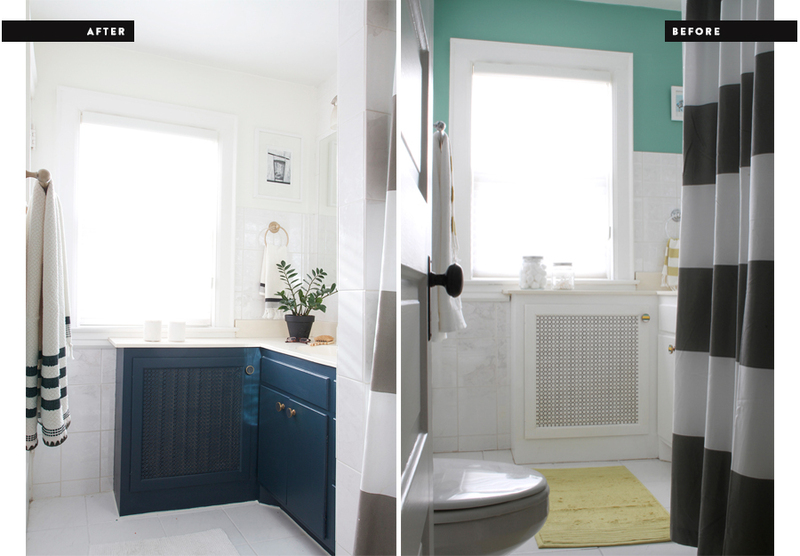 I had done a quick little makeover about a year-and-a-half after we moved in. It basically involved a coat of paint, a new shower curtain and some towels. It was okay. Now, after a few years living with it, that green color began to totally wear on me, and white just wasn’t a good color for a vanity that saw lots of dirty hands and little kid traffic. My inspiration for the vanity color came from a sentimental 7″ record. 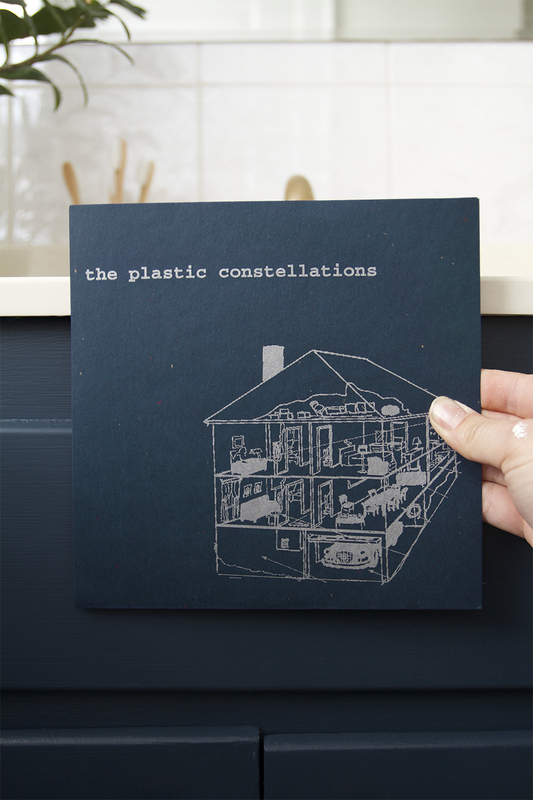 The Plastic Constellations was Jeff’s band that formed in high school – they went on to be a band for 10 more years, write four more records, go on countless tours, get an 8.5 review on pitchfork, and make tons of friends. Jeff and I spent much of our early 20’s driving around the country in a touring van – it was the best. Needless to say, TPC Blue was going to be the paint color of choice. Ace was happy to color match this sucker for me, and they can color match most anything as long as it is larger than a quarter, is opaque, and can be flattened to fit under the color matching robot machine. I thought the color would be close, but this is right on the nuts! 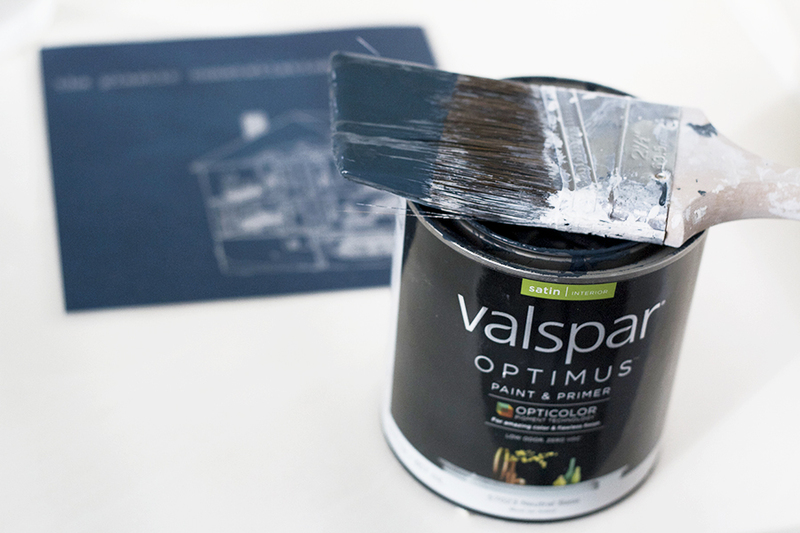 I had the color mixed with Valspar Aspire paint in a satin finish. I’ve used this paint in the past, and I always enjoy how smoothly it goes on, and how well it covers. 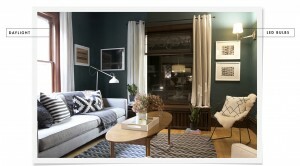 The walls were painted in Clark + Kensigton Linen, which I also used in the basement. Painting the walls and vanity was the easy part, and having these nice fresh surfaces gave me the motivation to tackle the real gritty stuff, like the discolored grout, and old caulk lines outlining the entire room. Let’s start with the grout. 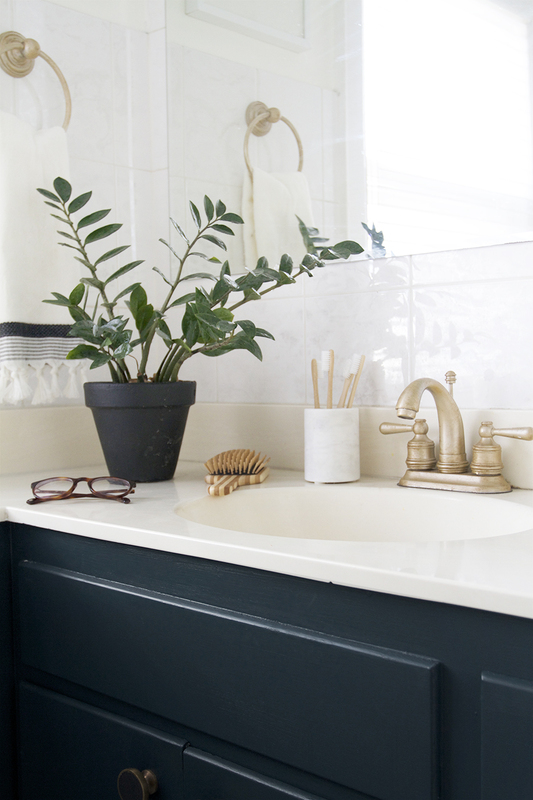 I get that white in a bathroom makes everything look crisp and clean, but it is so hard to keep up with, especially when it’s on the floor and especially in a bathroom used by the entire family. Our wide grout lines are a constant shade of grey, and it’s super gross and embarassing. Luckily, I have found a solution that makes the best of a bad situation. 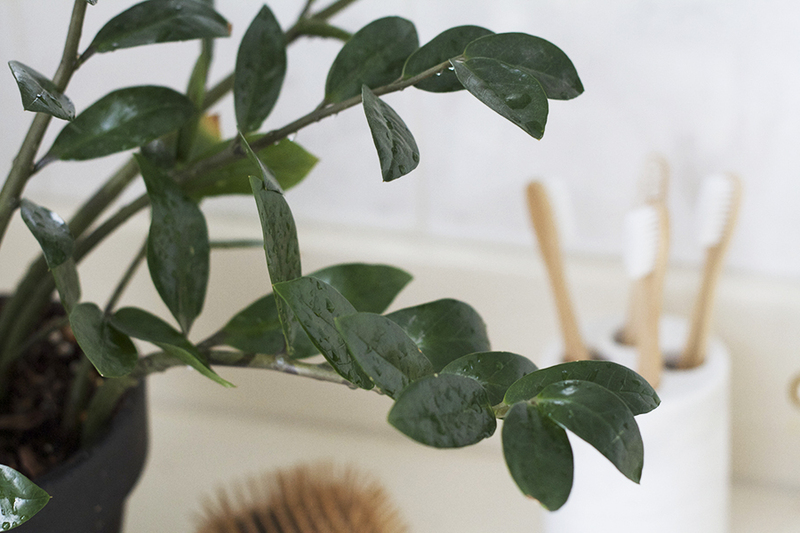 There is this grout coating called Tile Guard that does a good job of transforming grey grout, back into white. 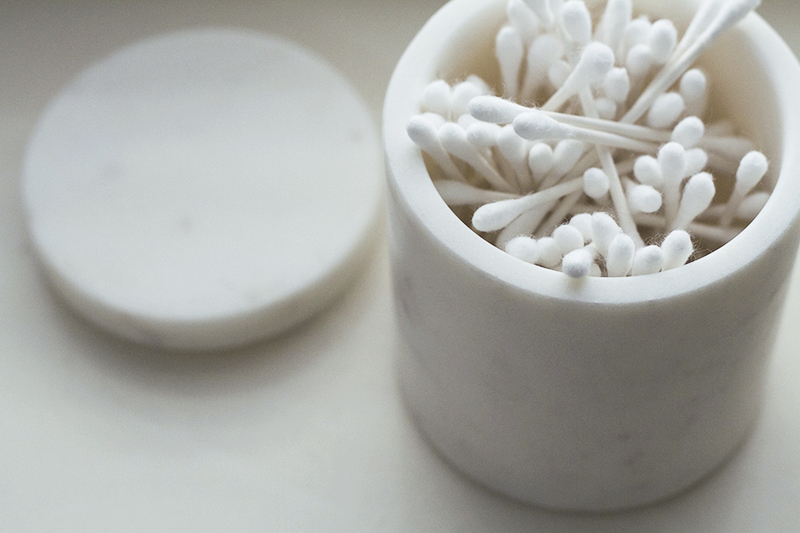 It’s easy to use, you just have to make sure that you allow a four hour dry time. Liberally apply the coating to the grout lines, let it sit four hours, and then wipe the coating off the tile with a damp rag. Much improved! Caulking bathrooms on the other hand is probably my least favorite job ever, and is why getting the bathroom shaped up continues to fall to the bottom of the to-do list. With all the potential guests about to judge me, this was the time to finally tackle this project. I put on some rubber gloves, got in there, and cleaned out all the caulk. Then, I scrubbed and cleaned all the caulk crevices with a water/bleach solution, and then reapplied new non-sanded tile caulk in a snow white. To caulk, I typically tape off the caulk line. Then I apply a bead of caulk, which doesn’t have to be perfect because you’ll be smoothing it out later. Once the bead is applied, take your finger, dip it in water, and then with consistent pressure, smooth out the caulk line. Slowly remove the tape for crisp clean edges and then one more time, wet your finger, and do one last pass over the line. This will smooth the caulk nicely and make a seamless transition between the two planes. Have a garbage bag and lots of paper towels on hand! Okay, so I kinda went nuts with the paint. I was so sick of the chrome fixtures (I can deal with nickel, brass or bronze but not this), purchased and installed by the previous owners, but I didn’t have the budget to purchase a new set. Someday this bathroom will be renovated, and making major purchases before that time happens doesn’t sound like super awesome or smart idea to me. Paint it is, and now that I know all about Amy Howard at Home, I knew that I could pull off a brass-ish look with a bit of spray paint and some wax treatments. I know, I can’t believe I’m fauxing stuff either, but sometimes, it’s just what you have to do to save a buck. 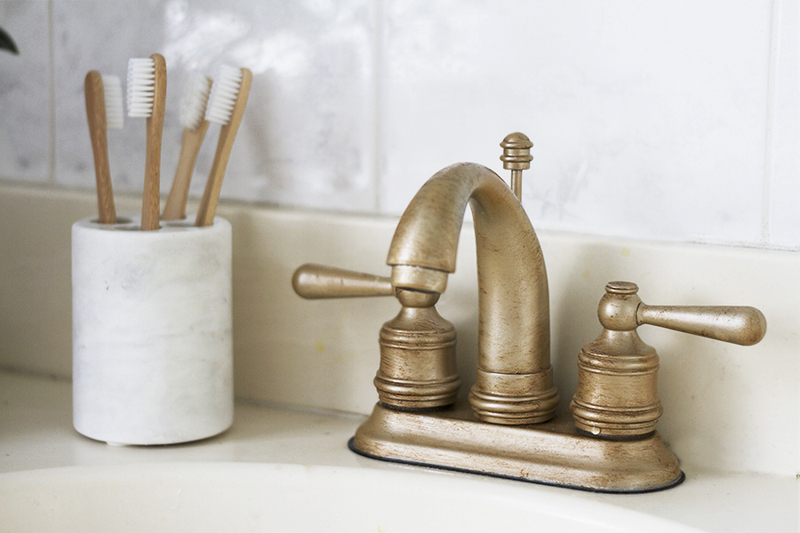 After masking off the bathroom faucet, I gave it a few light coats of gold spray paint. The finish at this point is okay, but it definitely looks spray painted. After I made sure it was good and dry I applied a light coat of light antique wax making sure to offload on cardboard before applying. I let the wax come to tack (about 10 minutes) before I applied an even lighter coat of dark antique wax. I made sure to offload nearly all of the wax onto a piece of cardboard, and then I very lightly brushed on hits of the dark wax. After it dried for an hour, I buffed it out with a lint free cloth. I was surprisingly pleased with the results. The brass-ish accents give the room a bit more sophistication than it had before, and it doesn’t look entirely fake. So, yay! I reused the same hardware that I had fallen in love with years ago. 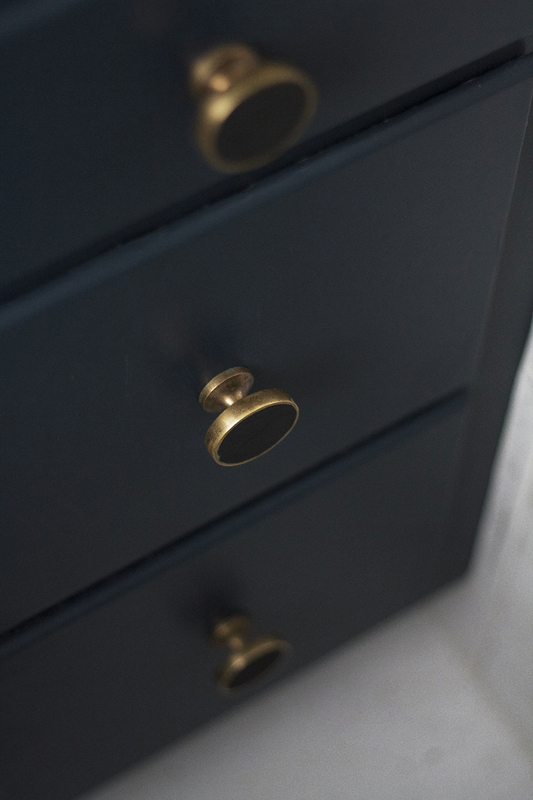 The enamel colors didn’t fit in with the new look of the room so I quickly painted the center of the brass circles black using my new go-to, Amy Howard chalk paint in black. I know you guys probably need to get ready for company too, together with Ace Hardware, I’m giving away a $100 gift card. Gift Card Giveaway to the rafflecoppter site to enter. Entries will be taken between now and December 4th at midnight. You can enter three ways, via facebook like, instagram follow, or just a basic entry. Happy Holidays, and good luck! Enter the $100 Ace Hardware Giveaway by Clicking Here! 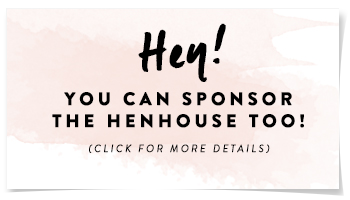 I’m excited to be collaborating with Ace Hardware as a part of their Ace Blogger Panel! Ace has provided me with compensation and some of the materials necessary to complete this project! All opinions are my own. Thanks a biznillion, Ace! I love this! That blue looks so good. Thanks, Lady! I want to paint everything that color blue now. 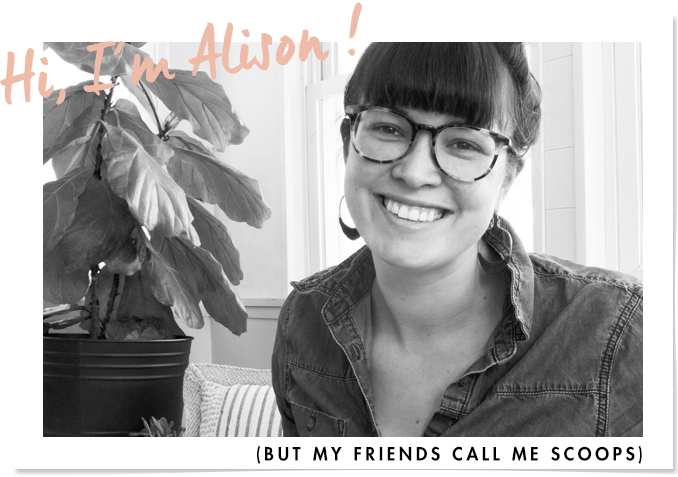 It looks great, Alison! 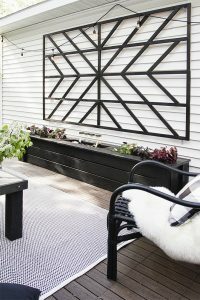 To be honest I’m far more interested in and impressed with approachable projects like these which show how you can transform a space on a little budget. I can relate to that. Noted. I do try and do most of my projects on a budget though, but I understand that building floating shelves might not be in everyones wheel house. What a change! Love it, especially the blue (and the great story about your husband’s band)! And I was excited about the Tile Guard, but the link shows it as being priced at $50.94 (on the Ace site). On amazon, the same size product is $5.66. Wonder if Ace’s site contains a typo? Oh no, I’ll let Ace know about that. It is either accidentally marked or it is for an entire case. It is usually around $6. Tip: I just picked up a wire basket at Home Goods that would match your new faux brass. It is round and that same muted tone. They also have square ones. I thought it would be a great catchall for towels or blankets, but when I got home I realized that it was perfect to use by the fireplace, (which is shiny brass), to hold firewood, newspaper and matches in a more sophisticated way. You should pick one up! Love the TPC Blue! Ooh, thanks for the tip. Sounds like that basket would be right up my alley. I bet that it looks great next to the fireplace too! 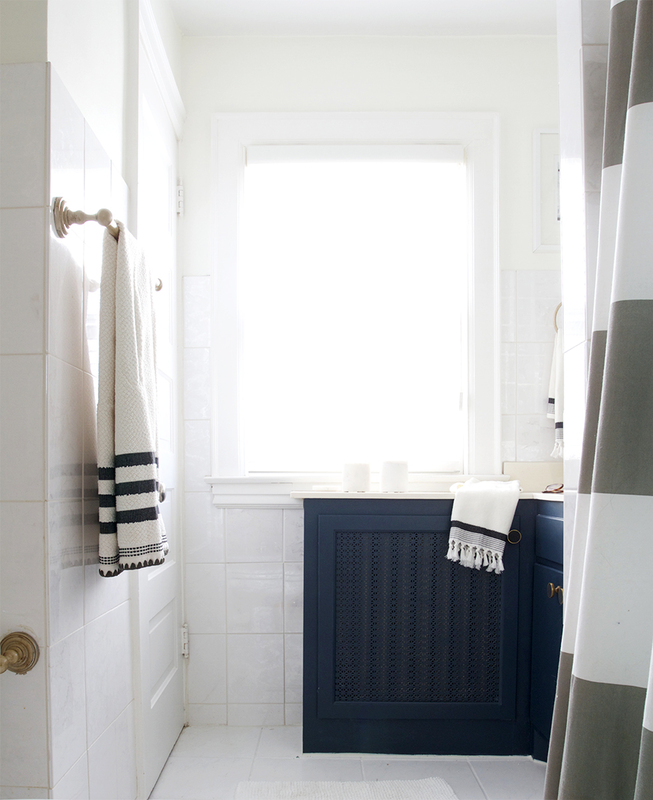 Would you be able to share where your towels are from? Thanks! For sure! Sorry I forgot to include that in the post. 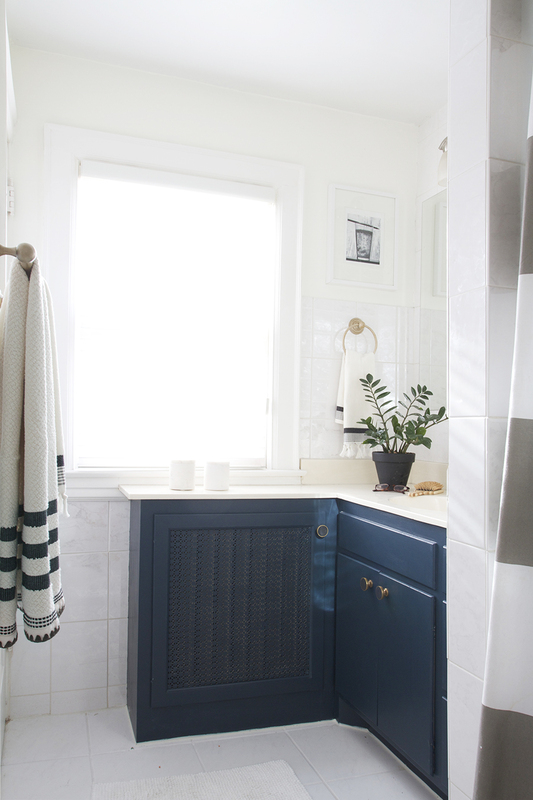 Here is a link to the bath towel, and hand towel, both from Target. Found my way here looking for advice / info on pruning my fiddle leaf fig (thank you for taking the plunge and reporting) and stopped to visit. Love, LOVE, what you did to the bathroom. The cabinets look great. Such drama and style. Now, I might have to undertake another project. Thanks for the ideas! Thanks Michele! So sweet of you to take the time to say so, and hope to see you back in the future. I NEED to do another fiddle leaf fig update, it’s been too long and much has changed. Love this! I have a vanity very similar in my home that is in desperate need of repainting. 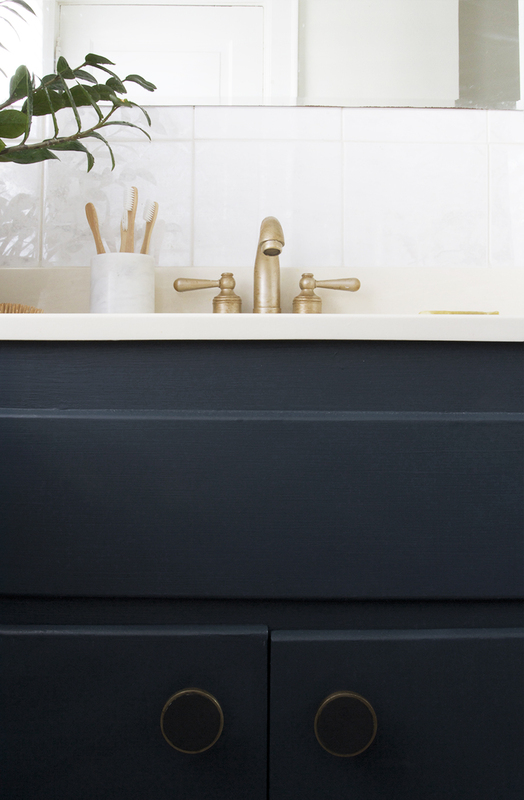 Did you do any prep work to the surface prior to painting with the new color?